Properties, Attachments, Metadata, HTML Formatting, Links, etc. Corrupted/Damaged, Password-protected, and Highly encrypted files. Divide large sized PST files by Size, Date, and Folder. Export only selected items from PST file(s). Gmail, Google Apps, Outlook.com, Yahoo, Hotmail, and IMAP accounts. Mozilla Thunderbird, Zimbra Desktop, Apple Mail, Lotus Notes, etc. 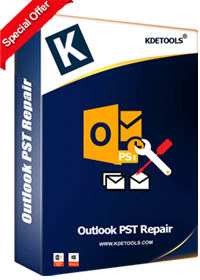 Recover all your deleted mails from PST files. Recover deleted items from password-protected PST files. Feel Free to Purchase KDETools Products! We are committed to 100% customer satisfaction & security and thus we provide 30 days money back guarantee. We guarantee that every purchase you make will be 100% safe & secure. Our servers use Secure Sockets Layer (SSL), so that only we can read our buyer's personal information.